In today's flashback to 1987, we saw the ARIA chart debut of Bon Jovi. Five years later, another seminal rock band landed their first top 50 single in Australia. But in 1992, I was less interested in them and more taken by a dance duo from Benelux. Stepping into the void left by the decreasingly successful wave of club acts that'd surfaced in 1989-90, the pair's blend of techno and Eurodance would prove irresistible in the years to come. They'd even almost top the chart with their debut single. An Australian dance group was at the top of the ARIA chart this week in 1992. "Love You Right" by Euphoria held on to the number 1 spot for a second and final week. A third and final top 100 entry for the New Jersey rock band. The single from The Smithereens' fourth album, Blow Up, was also their biggest US hit, reaching number 37. Number 96 "Bad Craziness" by D.A.D. The Danish rock band had almost infiltrated the top 50 with a couple of songs from previous album No Fuel Left For The Pilgrims, but this single from Riskin' It All was no "Sleeping My Day Away". The dance act's final single before they concentrated instead on production and remix work, especially for The Shamen. "Boulevard Of Broken Dreams" samples Marlena Shaw's "Woman Of The Ghetto" - also heard in The Blue Boy's "Remember Me". It'd been a UK number 2 at Christmas, but Australia passed on this big ballad from Diana Ross's The Force Behind The Power. She'd later re-record it with Westlife and just miss the UK Christmas number 1 spot again. Like The Smithereens, this was Troy Newman's third and final top 100 appearance. With the last two of those under-performing, the Australian singer was dropped by his label. This follow-up to "Just Like You" brought Robbie Nevil's chart career to an end as well. After this, Robbie focussed on songwriting and production work for other performers. After the world-conquering "Set Adrift On Memory Bliss", hip-hop duo P.M. Dawn didn't do so well with the follow-up. Could it be any coincidence that "Paper Doll" wasn't based on an instantly recognised sample? Perfectly listenable if somewhat repetitive, "Paper Doll" did feature samples, but of drum patterns rather than a hook from an '80s classic. Attrell and Jarrett Cordes wouldn't have another really big hit in Australia until they repeated the formula that'd made "Set Adrift..." so successful. There were just nine tracks on Black Box's debut album, Dreamland, including the title track, which only went for two minutes. And yet, the Italo house act issued a sixth single from it in the form of "Open Your Eyes". Remixed from the album, the track received only a half-hearted promotional push with the video below cobbled together from previous clips for "Everybody Everybody" and "Strike It Up". As a result, it became Black Box's first single to miss the top 50. An extended version of this single mix of "Open Your Eyes" could also be found on Black Box's remix album, Mixed Up! - a release that surprisingly didn't include megamix "The Total Mix". Even more surprisingly, the group would lift a seventh and final single from Dreamland - but if "Hold On" was released in Australia, it missed the top 100 completely. As Black Box's time as one of Australia's favourite dance acts drew to a close, 2 Unlimited were poised to take their place with debut single "Get Ready For This", which had been a massive hit in Europe towards the end of 1991. There were actually two duos involved in 2 Unlimited - 1) Belgian producers Jean-Paul DeCoster and Phil Wilde, who had written the music for "Get Ready For This", and 2) Dutch rapper Ray Slijngaard and singer Anita Doth, who added their parts to the instrumental track. Ray had worked with the producers in their previous guise as Bizz Nizz (although not on their UK top 10 hit, "Don't Miss The Partyline"). He and Anita became the faces of 2 Unlimited, even if their vocals were edited out for the Orchestral Mix, which became the main version of the song in the UK. Both versions were included on the Australian release, but I've always preferred the longer mix (below) which retains their input. "Get Ready For This", which was sampled in Kylie Minogue's current hit "I Guess I Like It Like That", was the first of a string of chart hits for 2 Unlimited, but would end up being their biggest single locally. It was also the act's only major hit in the US - although not until 1994, when it finally reached the top 40 there - and continues to be used by American sports teams and cheer-leading troupes. I didn't think I knew this minor hit from John Mellencamp, but it was definitely familiar when I gave it a listen. Although, it also sounds like any number of other John Mellencamp songs, so it could be that. That said, I like the laidback "Again Tonight" much better than previous single "Get A Leg Up", even if it turned out to be a much less successful single locally. Their own songs like "I Say Nothing" and "Don't Call Me Baby" had really deserved to do much better, but Voice Of The Beehive finally achieved the chart success that'd so far eluded them with this brilliant remake of The Partridge Family's 1971 chart-topper, "I Think I Love You". Taken from their pun-tastically named album, Honey Lingers, the cover version would prove to be the only substantial hit for the band fronted by sisters Melissa Brooke Belland and Tracey Bryn, and featuring Madness drummer Woody in its line-up. With Nirvana firmly ensconced in the ARIA top 10, along came Pearl Jam with their debut single, "Alive" - and so, the grunge scene was off and running in Australia. The song that'd gained Eddie Vedder the job as singer of the group, "Alive" had started out as an instrumental demo to which he added his vocals after writing the lyrics. The song is an alternate version of Eddie's life story - the singer had discovered the man who raised him was his step-father and that his biological father had died some years earlier. With its angry feel and low-budget music video, "Alive" helped set the tone for the emerging rock genre. Its top 10 placing in Australia was the band's first major chart success anywhere in the world, but that was also because the song had only been given a limited release in the US at that stage. Meanwhile in Australia, local rock band Candy Harlots burst into the top 100 at number 17 with their first EP on Virgin Records. Foreplay didn't get any higher and backtracked out of the top 50 in seven weeks, but it was an attention-grabbing appearance for a band that'd undergone a fair amount of upheaval since forming in 1987. The EP's lead track, "The Lady Shakes", veered more towards the style of rock that grunge was supplanting, which may explain why Candy Harlots never enjoyed a hit as big as this again. Next week: more landmark rock singles reach the chart. Oh, good. Luckily for me, there's some songs I like in the Off The Chart and Breakers sections. The Beatmasters track is very similar (due to using the same sample) to De La Soul's 'A Rollerskating Jam...'. I liked 'Paper Doll' more than 'Set Adrift...'. I remember hearing (maybe on American Top 40) it either held the record or came second to MC Hammer's 'Pray' for the most repetitions of a song title within a song's lyrics. I expected they'd be a one-hit wonder after this one flopped. A seventh single (counting 'The Total Mix') from 'Dreamland' was really pushing it, with 'Hold On' (which I didn't spot when looking through '92's ARIA reports, so mustn't have been released here) being the only track with vocals on it not released as a single at this point. I wonder why a proper video wasn't filmed for this one. If I remember correctly, there was a TV ad for a Black Box 'live' tour here in early '92 (which of course never eventuated), so Katrin was still part of the 'group' then. I suspect there may have been some chart-rigging happening around this time, as I'd never heard the 2 Unlimited, Voice of the Beehive or Candy Harlot tracks until they debuted in the top 50. I was pleasantly surprised by 'I Think I Love You's success, though it's a pity it was their only real hit here. I liked later 2 Unlimited singles more, but this one was a good introduction. I always associate 'Get Ready...' with being used as background music on the ABC game show 'Vidiot'. I really dislike 'Alive'. I didn't realise what 'Pearl Jam' was referring to until it was hinted at on an episode of the SBS comedy 'Life Support' in the early 00s. Ah, 2 Unlimited! I wonder if they ever thought their synth riff here would go on to be as inescapable as it was. 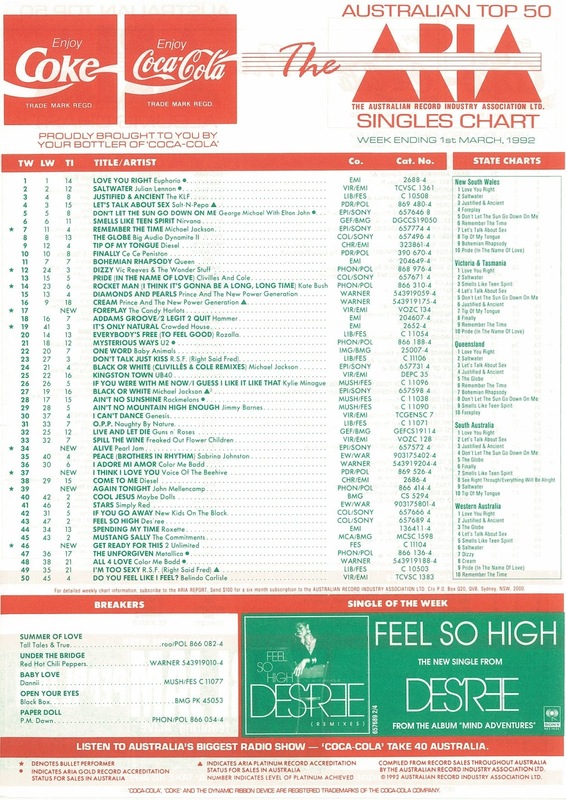 March 1992 was a good month for chart music. By the way, I never knew what a chart 'Breaker' was, despite efforts to find out. I know it's not the same as a debut or a bullet...can anyone help me out? Breakers were the next five songs moving up the chart outside the top 50. There were some exceptions - sometimes a song that had been inside the top 50 briefly would register as a breaker and then, more often than not, re-enter the top 50. Thanks Gavin! I always wondered. Five great debuts this week. I instantly became a big fan of 2 Unlimited and bought a lot of their cassingles over the next 3 years. I loved this change of direction for dance music around this time. I love eurodance. I liked Mellencamp at the time but I've certainly come to appreciate his music more as I've gotten older. This song is one of my faves of his. I wasn't aware I Think I Love You was a cover at the time but I thought it was great on its own merits. I still prefer this over the original. I bought Honey Lingers a few years later and it's a very high quality album. Pearl Jam. What can I say? My 2nd fave band of all time. One amazing album after another. They've never released anything sub par. True definition of legends. I was aware of Candy Harlots before they charted but became hooked straight after. Went and bought the Ep and loved it. The lead track, by the way, was Danger. It wasn't track 1 but it was the song they played on radio and Rage. I'm a bit confused by the Candy Harlots release. Danger seems to have been a stand-alone single before Foreplay and there was a mix of the song called the El Dorado version included on Foreplay according to Discogs (https://www.discogs.com/Candy-Harlots-Foreplay/release/4100196). Was that the version that got promoted or were they still playing the single version? That's a great question. Both versions are very similar and it was 25 years ago so it could have been either to be honest. The El Dorado version simply sounds like a re-recorded version of the original with a slightly cleaner production value. The video version is definitely the original but can't say which one they played on Take 40. Sorry I couldn't be more helpful. Actually, rage aired 'The Lady Shakes' (mis-titled by them as 'Ladyshakes' from memory) when it was in the top 50. I had a look through some ARIA Reports, and 'Foreplay' was released on 17/2/92. 'Danger' was released as a single on 9/9/91. My memory must be playing tricks on me. I don't recall ever seeing the video for The Lady Shakes, so figured it must have been Danger. Take 40 definitely played Danger though.